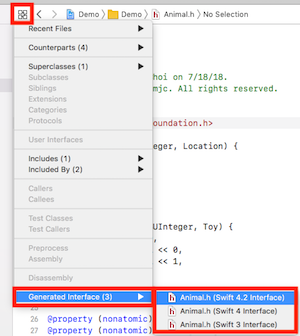 If you have ever called Objective-C code from Swift, you may have noticed the “Generated Interfaces” feature in Xcode. But have you noticed the details of the said “generated interfaces”? For those of you who don’t know what I’m talking about, Xcode has a feature where you can view the automatically generated Swift interfaces of Objective-C files from the editor. This is way, you can see how your Objective-C expressions are parsed into their Swift counterparts, before compiling anything. That’s cool and all but did you notice how objc expressions were exactly parsed into their Swift counterparts? If you didn’t, let me point them out to you. Notice that the initWithName is automatically shrunk to init(name:) to follow Swift’s naming style 😱. This allows you to name your objc functions without worrying about how they are going to look in Swift. Also, notice how initFor is separated into init(for:). Cool, eh? Assuming the above initializers are for the Animal class, let’s make our Animal do something by adding some functions. Here, things seem pretty straightforward but once again, notice the details! The sleepFor:, playAt:, playWith: have been parsed as sleep(for:), play(at:) and play(with:). Now that the Animals can do something, let’s make some Locations where we can play with our Animals. Notice how I named the enum cases like how any good objc developer should; TypeNameCaseName. That’s cool but Swift favors simplicity and readability when it comes to naming. Thankfully, Xcode automatically takes care of that for you, again. Now look at the below Swift code that is calling objc code. Doesn’t it look like you are calling native Swift code? Here’s a sample Xcode project for you to play around with.